Maintaining the health and quality of life of more than 60 million informal caregivers across the United States is a major public health concern (National Alliance for Caregiving & AARP, 2009). The practice of informal caregiving substantially reduces the strain on the national health care system. Informal caregiving saves the national economy approximately $522 billion annually and is substantially more economical than skilled paid care (Chari, Engberg, Ray, & Mehrotra, 2015; Reinhard, Feinberg, Choula, & Houser, 2015). Many informal caregivers are family members who divide their time to fulfill their home and work obligations while providing care for their loved one(s). Informal caregiving can result in negative physical and psychological health consequences and decreased quality of life for caregivers, which is often referred to as caregiving-related stress or caregiver burden (Pinquart & Sörensen, 2011; Schulz & Sherwood, 2008). However, for informal caregiving practices to be successful, the effects of caregiving on health and quality of life must be mitigated while still maintaining benefits to society and the national health care system. It is well-established that the distribution of caregiving duties (Do, Cohen, & Brown, 2014; Janevic & Connell, 2001) and resultant effects on caregiver health and quality of life (Roth, Dilworth-Anderson, Huang, Gross, & Gitlin, 2015) vary by socioeconomic and demographic factors. However, few nationwide studies have examined these differences systematically. Therefore, the first objective of the current exploratory study was to examine socioeconomic and demographic disparities in caregiving intensity and caregiver quality of life. A substantial proportion of informal caregivers are part of the “sandwich” generation—caregivers who simultaneously provide care for a child and a parent or other older adult. Most of such caregivers are women (Buck, 2013). Although the impacts of being a “sandwiched” caregiver have been well-studied, findings have been mixed (McGarrigle, Cronin, & Kenny, 2014). For sandwiched caregivers, the additional caregiving responsibilities of caring for a child and parent may lead to increased stress, role conflict, and decreased well-being (Rubin & White-Means, 2009; Stephens, Townsend, Martire, & Druley, 2001). However, other studies suggest that caregiving activities may have benefits for sandwiched caregivers (Fingerman, Pillemer, Silverstein, & Suitor, 2012; Loomis & Booth, 1995). Therefore, determining if and how dual caregiving responsibilities impact the quality of life of sandwiched caregivers is essential to protecting the quality of life of this subpopulation of informal caregivers. To address this issue, the second objective of the current study was to assess the experiences of male and female sandwiched caregivers through investigating the potential for this dual caregiving role to be associated with caregiving intensity and caregiver quality of life, potentially altering the relationship between them. A secondary analysis of data was conducted using the 2011 National Study of Caregiving (NSOC), a national survey of informal caregivers providing care for participants in the National Health and Aging Trends Survey (NHATS) (Freedman et al., 2011; NHATS, 2016). When NHATS participants were deemed potentially eligible for the NSOC, all caregivers identified by participants as helping with any activity were reviewed for NSOC eligibility. If at least one caregiver was deemed eligible, then the individual was considered eligible for the NSOC. NHATS participants could identify up to five caregivers who provided the individual with assistance in personal care or household tasks. Those caregivers were contacted via telephone and asked to participate in the 30-minute NSOC interview. The sample was restricted to offspring caregivers—sons, daughters, and stepchildren—of NHATS participants (N = 1,014). The dataset included nine instruments designed to comprehensively assess the informal caregiver experience: care activities, duration of care, aspects of caregiving, support environment, participation in non-caregiving activities, health, employment, health insurance and income, and household composition. To address the first study objective, several components of caregiver intensity were examined. The first is the sum of the number of activities of daily living (ADLs), which includes providing assistance with functional mobility (transferring), toileting, bathing, eating, and dressing. The second measure of caregiver intensity used was instrumental activities of daily living (IADLs), which was a sum of activities caregivers assisted, which included chores, shopping, medicine, paying bills, driving/transportation, administering shots, preparing a special diet, brushing teeth, checking feet, wound care, making and managing medical appointments, speaking with medical providers, and helping with health insurance administration. Two other components of caregiving intensity used were average hours per month spent providing care and duration (years) of caregiving. Three domains of caregiver quality of life were identified through principal components analyses: social, emotional, and financial burden. Details on instrumentation, specific variables used in each domain, reliability, and validity statistics of these measures are available in a previous study (Cohen, Cook, Kelley, Sando, & Bell, 2015). Summary scales obtained from each component were used as the main outcome variables of caregiver quality of life. Continuous measures of each were obtained, then internally standardized to facilitate comparisons among models where all model outcomes (caregiver intensity and caregiver quality of life) are measured on the same scale. Several socioeconomic and demographic factors were identified from previous studies to assess disparities in caregiving intensity and caregiver quality of life: caregiver age, marital status, race/ethnicity (White, Black, other), co-residence with care recipient, household income, gender, and presence of a child younger than 18 in the home, and the interaction of gender and presence of a child younger than 18. Figure 1 shows an overview of the study design and how the study domains and research questions relate to each another. For the first objective, generalized linear models were used to assess associations between each caregiver measure (caregiving intensity and caregiver quality of life) and sociodemographic factors. For the second objective, to evaluate how different components of caregiving intensity are associated with three elements of caregiver quality of life, partial correlation methods were used to control for the socioeconomic and demographic covariates. Respondents were stratified separately and jointly by gender and presence of a child younger than 18 in the home (i.e., sandwiched caregivers). Generalized linear models were then used to assess associations between caregiving intensity and caregiver quality of life, stratified by gender, sandwiched status, and gender and sandwiched status simultaneously. SAS version 9.4 and IBM SPSS version 23 were used for all statistical modeling. Overview of study diagram showing research questions (RQs), concepts, and specific measures used. 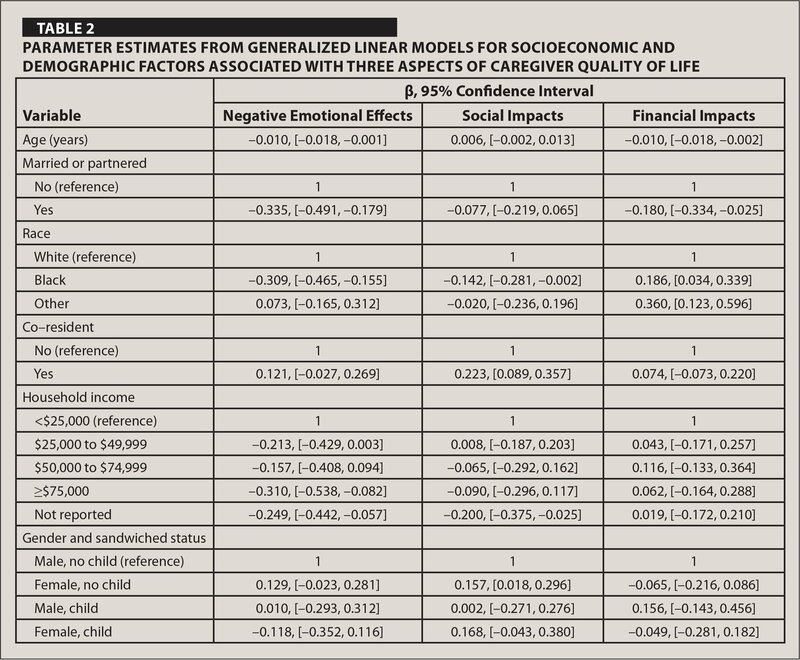 To address the first exploratory research objective of assessing socioeconomic and demographic disparities in caregiving intensity and caregiver quality of life, Table 1 displays the parameter estimates from the generalized linear models for five outcomes of caregiving intensity, and Table 2 displays the parameter estimates for three outcomes of caregiver quality of life. Compared to White caregivers, Black caregivers had higher levels of overall caregiving intensity (β = 0.293, 95% confidence interval [CI] [0.140, 0.447]), number of IADLs performed (β = 0.060, 95% CI [0.030, 0.090]), and hours spent caregiving per month (β = 0.025, 95% CI [0.002, 0.049]). However, Black caregivers experienced significantly less negative impacts on quality of life in terms of negative emotional effects (β = −0.309, 95% CI [−0.465, −0.155]) and social impacts (β = −0.142, 95% CI [−0.281, −0.002]). Black caregivers and caregivers from other races experienced significantly higher financial impacts than White caregivers. Co-residence with the care recipient was also associated with higher intensity caregiving. Overall, and especially for hours spent caregiving per month, caregiving intensity was highest in respondents with lower incomes. Compared to males without children in the home, females without children in the home (β = 0.074, 95% CI [0.044, 0.104]) and sandwiched female caregivers (β = 0.070, 95% CI [0.024, 0.116]) performed a significantly higher number of IADLs. 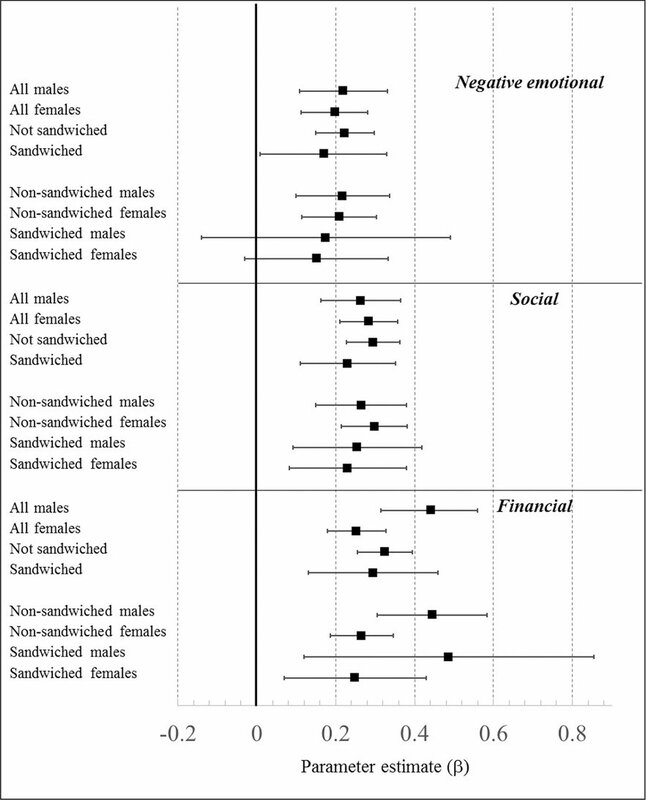 Non-sandwiched females also experienced significantly higher social impacts on quality of life (β = 0.157, 95% CI [0.018, 0.296]) than non-sandwiched males. Partial correlations between caregiving intensity and caregiver quality of life for the sample by gender and sandwiched status, and adjusted for age, marital status, race/ethnicity, co-residence with care recipient, and household income, are presented in Figure 2. Caregiving intensity was most strongly associated with informal caregivers' social and financial well-being. For example, associations between caregiving intensity and social impacts of quality of life were most pronounced in sandwiched females overall (r = 0.438, p < 0.001), as well as for number of ADLs (r = 0.473, p < 0.001) and hours spent caregiving per month (p = 0.413, p < 0.001). Associations were weaker but still significant for other demographic groups, including non-sandwiched males and females and sandwiched females. 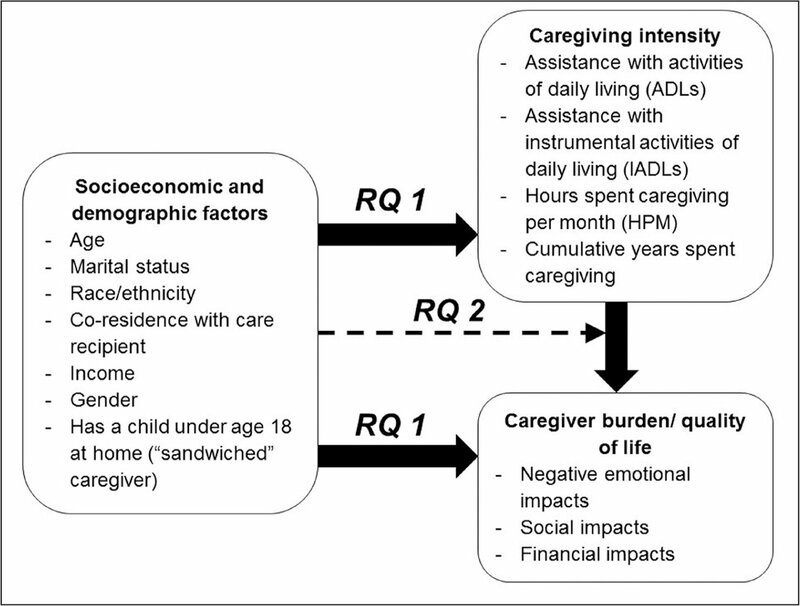 Model-based associations between overall caregiving intensity and caregiver quality of life for each demographic subgroup are shown in Figure 3. Each gender and sandwiched status subgroups for social and financial outcomes showed statistically significant associations. The strongest effects were in males (β = 0.445, 95% CI [0.306, 0.583]), particularly sandwiched males (β = 0.487, 95% CI [0.120, 0.854]). For negative emotional outcomes, associations were statistically significant for all subgroups except sandwiched females and sandwiched males. 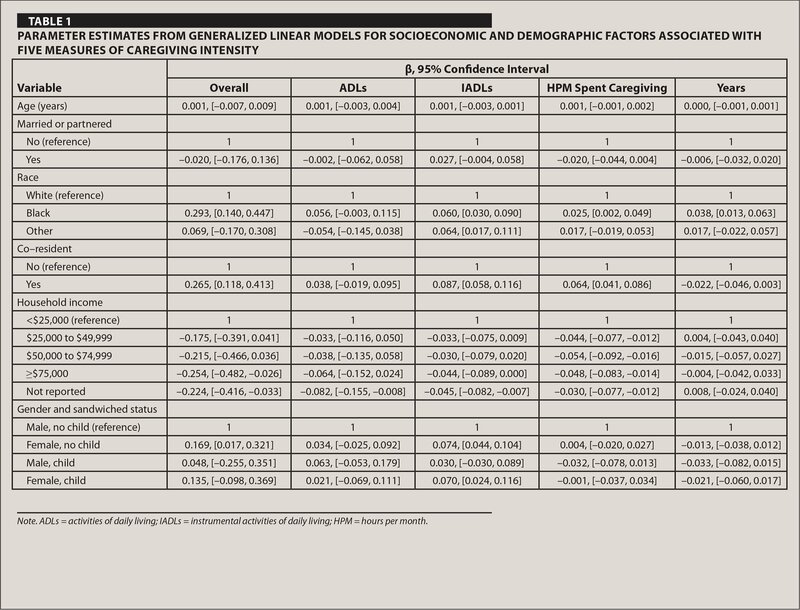 Partial correlation coefficients for the association between five measures of caregiving intensity and three aspects of caregiver quality of life (overall and by demographic subgroups). Red boxes indicate positive correlations and blue boxes indicate negative associations. Overall caregiving intensity is a standardized composite score of the four component variables. Note. ADLs = activities of daily living; IADLs = instrumental activities of daily living. Model-based parameter estimates for the association between standardized measures of caregiving intensity and caregiver burden by gender and sandwiched status. The current findings highlight several implications of informal caregiving. First, substantial disparities exist among demographic subgroups regarding caregiving intensity and caregiving duties. Female, Black, and low-income caregivers tend to provide the highest intensity care. However, associations between sociodemographic factors and impacts on caregiver quality of life were somewhat different. Compared to White caregivers, Black caregivers were significantly less impacted socially and emotionally from caregiving, but significantly more impacted financially. This difference in psychosocial effects is consistent with previous studies that found that caregiving was associated with increased depression and decreased life satisfaction in White females, but not in Black females (Haley et al., 1995), which may be partly due to greater resiliency in Black individuals to cope with stressors associated with caregiving duties (Roth, Haley, Owen, Clay, & Goode, 2001; Sörensen & Pinquart, 2005). Inversely, sandwiched males had the lowest overall caregiving intensity, yet experienced the strongest associations between caregiving intensity and social impacts on quality of life compared to their female counterparts, both sandwiched and not sandwiched. Much of the previous research has focused on physical, psychological, and emotional effects of caregiving (McGarrigle et al., 2014; Schulz & Sherwood, 2008; Sörenson & Pinquart, 2005); comparatively few studies have focused on other potential consequences of caregiving, such as effects on social aspects of life (Haley et al., 1995). Further research is needed to assess potential reasons for the seemingly paradoxical finding that sandwiched males have lower caregiving responsibilities, yet report experiencing high social impacts due to their caregiving duties. The associations observed in the current study varied by the way in which caregiving intensity was measured. In other words, distinct aspects of caregiving may impact caregiver quality of life in different ways. For instance, hours of caregiving performed per month and number of ADLs performed were significantly associated with increased social impacts among sandwiched male caregivers, yet a significant association between number of IADLs performed and social impacts was not observed. Caregivers who have been providing care for a longer period of time may be less likely to be impacted socially, whereas caregivers providing other high intensity care (e.g., ADLs, IADLs, more hours) may be more likely to be negatively impacted socially. Therefore, assessing caregiving intensity is multi-dimensional, with each aspect of caregiving intensity (e.g., duration, time per month) impacting caregiver quality of life in unique ways. Traditional one-size-fits-all approaches to protecting caregiving quality of life may be insufficient to address the diversity of caregiving duties and effects on quality of life. Further research can elucidate the mechanisms through which these associations occur, and the effectiveness of programs that may target the most potentially harmful aspects of informal caregiving to ultimately reduce multiple types of perceived caregiver burden and improve caregiver quality of life. The current study has several notable strengths. One strength is that this is among the first caregiver studies to use a nationally representative sample of informal caregivers in the United States identified by care recipients. In addition, multiple caregivers for each care recipient were included in the sample. There were a total of 799 families represented, with one to three offspring caregivers per family. Multiple domains of caregiving intensity and caregiver quality of life were examined. Informal caregiving is multidimensional and affects not only the physical and emotional health of caregivers, but also other aspects of caregiver quality of life. Results suggest that not all aspects of caregiving intensity affect caregiver quality of life equally and affect different subgroups of caregivers the same way. The current study is also subject to several important limitations. First, the analysis is cross-sectional, which limits the ability to determine causation. The NSOC will be releasing a second set of data in late 2017, which will facilitate longitudinal analyses. Second, caregiver quality of life has additional dimensions beyond the three assessed. Furthermore, the sample was restricted to offspring caregivers. Therefore, the findings cannot be extended to spousal or other non-kin, informal caregivers. Lastly, in this analysis, many sociodemographic variables were treated as confounders. However, previous research suggests that the association between informal caregiving and quality of life differs markedly by sociodemographic factors (Do et al., 2014). Future research should examine the potential for these observed associations to vary by key sociodemographic factors, including the ones investigated in the current study, as well as others, such as employment, total wealth, and proximity to care recipient. If such variability occurred, those findings could be used to further refine programs designed to target caregiving subgroups most at risk for negative outcomes as a result of informal caregiving activities. With aging and changing demographics in the United States, the need for informal caregivers to provide care for older adults continues to increase (Finer & Philbin, 2014; Fries, Bruce, & Chakravarty, 2011). Moreover, the profile of these caregivers, particularly those who are children of their care recipient, is likely to change as a result of these demographic changes. Many current and future caregivers face or will face numerous competing demands, such as employment, child care, and maintaining their own health. Therefore, understanding precisely how informal caregiving affects various aspects of caregiver quality of life and well-being is critical to inform public health policies and programs designed to support caregiver quality of life and protect this critical component of the U.S. health care system. Dr. Cohen is Assistant Professor, Department of Kinesiology, Health Studies Program, College of Health Sciences, University of Rhode Island, Kingston, Rhode Island; Ms. Cook is Research Epidemiologist, Center on Society and Health, Dr. Sando is Doctoral Student, and Dr. Longo is Professor, Senior Investigator and Special Assistant to the Chair, and Research Director Emeritus, Department of Family Medicine and Population Health, Virginia Commonwealth University, Richmond, Virginia; and Dr. Brown is Research Assistant Professor, College of Behavioral & Community Sciences, University of South Florida, Tampa, Florida. The authors have disclosed no potential conflicts of interest, financial or otherwise. The National Health and Aging Trends Study is sponsored by the National Institute on Aging (U01AG032947) through a cooperative agreement with the Johns Hopkins Bloomberg School of Public Health. Address correspondence to Steven A. Cohen, DrPH, MPH, Assistant Professor, Department of Kinesiology, Health Studies Program, College of Health Sciences, 25 Independence Square, Suite P, University of Rhode Island, Kingston, RI 02881; e-mail: steven_cohen@uri.edu.